Physicists have shed new light on one of the greatest mysteries in science: Why the Universe consists primarily of matter and not antimatter. Antimatter is a shadowy mirror image of the ordinary matter we are familiar with. For the first time, scientists have measured the forces that make certain antimatter particles stick together. The findings, published in Nature, may yield clues to what led to the scarcity of antimatter in the cosmos today. 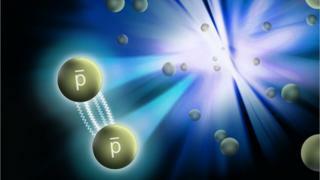 The forces between antimatter particles - in this case antiprotons - had not been measured before. If antiprotons were found to behave in a different way to their "mirror images" (the ordinary proton particles that are found in atoms) it might provide a potential explanation for what is known as "matter/antimatter asymmetry". At the beginning of the Universe, the Big Bang produced matter and antimatter in equal amounts. But that's not the world we see today: instead antimatter is extremely rare. Some phenomenon must have led to the overwhelming dominance of matter; scientists have their theories, but the evidence remains elusive. "Although this puzzle has been known for decades and little clues have emerged, it remains one of the big challenges of science," said co-author Aihong Tang, from the Brookhaven National Laboratory in New York, US. "Anything we learn about the nature of antimatter can potentially contribute to solving this puzzle." Thankfully, antimatter can be produced by particle accelerators - albeit in tiny amounts - giving scientists the opportunity to study its properties. Using a particle smasher called the Relativistic Heavy Ion Collider (RHIC) at Brookhaven, physicists were able to measured the force of interaction between pairs of antiprotons. The scientists found that the force between antiproton pairs is attractive, just like the strong nuclear force that holds protons together within atoms. Antimatter particles have the same masses as their ordinary matter equivalents, but carry opposite charges. Zhengqiao Zhang, another scientist who studied the antiproton interactions using the RHIC, said: "We see lots of protons, the basic building blocks of conventional atoms, coming out, and we see almost equal numbers of antiprotons. "The antiprotons look just like familiar protons, but because they are antimatter, they have a negative charge instead of positive, so they curve the opposite way in the magnetic field of the detector." Within the accuracy of these measurements, matter and antimatter appear to be perfectly symmetric. There didn't appear to be some asymmetric quirk of the strong force that could account for the continuing existence of matter in the Universe and the scarcity of antimatter. That points scientists towards other explanations for the matter/antimatter asymmetry. For example, neutrinos (another fundamental building block of the Universe) might be their own antiparticles. Differences in the way neutrino particles interacted after the Big Bang might have led to a slight matter excess that allowed our Universe to exist.